RootsMagic Blog » Win an iPad in the RootsMagic 2013 RootsTech Treasure Hunt! 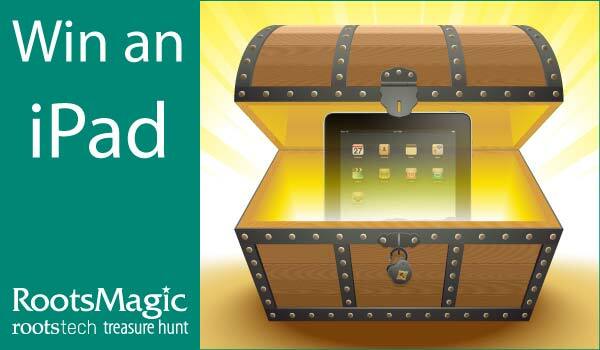 Win an iPad in the RootsMagic 2013 RootsTech Treasure Hunt! It’s been a tremendous last few months here at RootsMagic. We’ve been busy with the new releases of RootsMagic 6 and RootsMagic for iPad, iPhone, and iPod touch. We’re also excited to participate in one of the largest genealogy events in North America- RootsTech! We want to celebrate these momentous events with you, our loyal users! And what better way to celebrate than with a treasure hunt where you could win one of many prizes including an iPad (4th generation)! From Thursday, March 21 through Wednesday, March 27, 2013, visit http://www.rootsmagic.com/treasure for a complete list of the blogs where the 15 clue words can be found. Visit each blog, collect all 15 clue words, uncover the secret message, and you could win software, prizes, or an iPad (4th generation)! Once you’ve collected the clues there are two ways to enter- in person or at home. If you’re lucky enough to attend RootsTech in person, pick up an entry card at the RootsMagic booth (#401) in the Exhibit Hall. Write the clue words on the back of the card and return it to the RootsMagic booth in the Exhibit Hall by Saturday, March 23, 2013 at 1:20 pm. At that time, we will hold the prize drawings. You must be present to win. We didn’t want those who aren’t able to attend RootsTech in person to feel left out so we’re holding a second drawing and giving away more prizes including a second iPad. To enter this drawing, visit http://www.rootsmagic.com/treasure anytime between Thursday, March 21 and midnight MST on Wednesday, March 27, 2013. Fill out the online form to be entered into the second drawing. You may enter both drawings but one entry per person, per drawing. Winners will be picked at random and notified via e-mail by Friday, March 29, 2013. Remember, the treasure hunt doesn’t begin until this Thursday. Good luck! I have been using FamilyTree Maker for years and just decided to give RootsMagic a try. I’m Glad I did. Roots Magic offers so many more reports and other things you can do with your family file. I’ve even purchased Family Historian and believe this will be a greater help to me putting the stories all together. I switched to RootsMagic years ago…I still love this program! Good to be associated with a Roots Magic User group again. I’ve just now received and installed RM6. For several years we’ve had a site (fenrichfamily.com) up and running, but took it down a few years back. I look forward to getting with our nearest user group, soon.